Your attic contains some of the most important energy details in your home. It’s worth taking a look up there periodically to be sure that everything is in order, and to see if upgrades might help you save energy and money. Your attic insulation provides an important barrier against both the cold of winter and the heat of summer, and improving your attic insulation is still one of the best home efficiency investments available. Measure your attic insulation. It should be thick and even: at least 16 to 20 inches in cold climates and 12 to 16 inches in moderate climates. Contact an insulation contractor to add more if it’s not. Duct leaks in the attic are among the most expensive energy defects. If your heating or cooling system includes ducts in the attic, inspect them carefully. If you find disconnected ducts or loose joints, seal them up with metal duct tape or with duct mastic. Avoid common gray fabric “duct tape” since it tends to come loose. Your bath and kitchen fans carry moisture out of your home so it can’t accumulate and cause damage. But they shouldn’t just deposit this moisture into your attic. Locate your bath and kitchen fans from inside your home, then find where they penetrate the ceiling up in the attic. Confirm that your fans are attached to ducts that carry the moist air all the way outdoors. If needed, add flexible ductwork that connects these fans to a nearby attic vent. 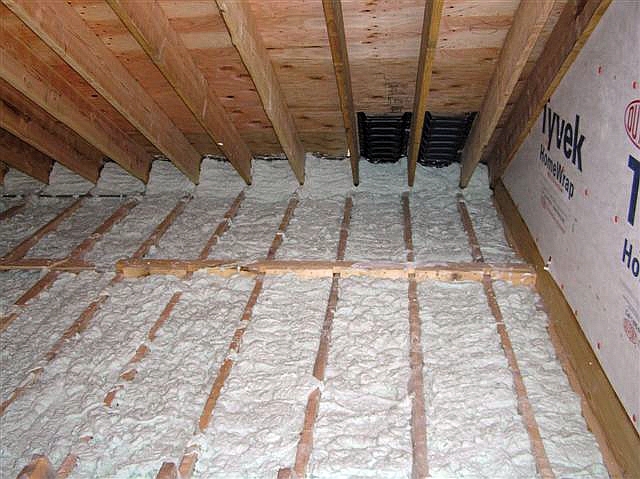 Your attic insulation will be drier as a result, helping it can perform as well as the day it was installed.